While you are in Montisi, why not visit the cheese festival in nearby Pienza? 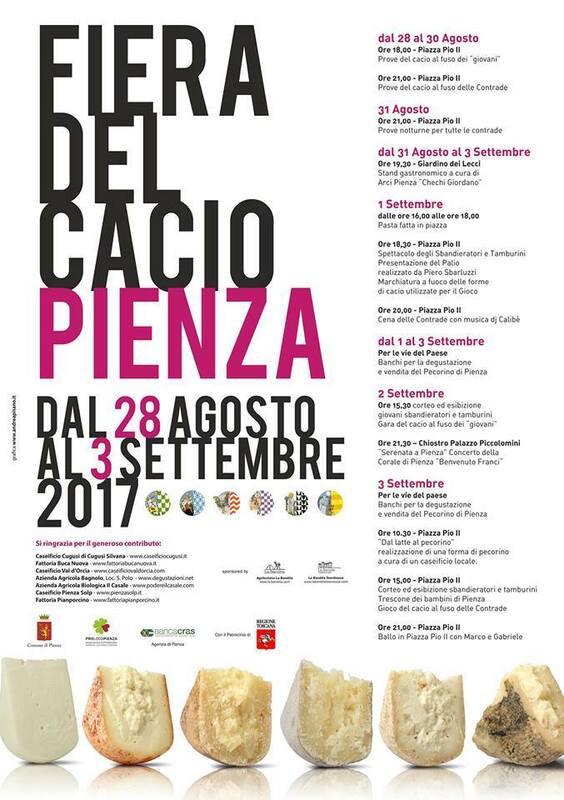 From 28 August to 3 September 2017, Pienza hosts a week full of events to celebrate their most renowned Pienza product which is pecorino cheese. It used to be called Cacio. This festival is one of the most anticipated events by locals and tourists alike. They are attracted not only by the opportunity to enjoy the precious local cheese, but also by their interest in the popular Game of the ‘Cacio al Fuso’, where the 6 Contradas (districts) compete for the the Palio (banner). The fair ends with dancing in the main square. The complete programme is here. Cacio al Fuso is the popular game of Pienza. It is historical first mentioned in the sixteenth century statutes of the city of Pienza (according to which it could not be done publicly in the urban streets, unless licensed by the competent authorities). It’s a game in which the cheese is rolled in the main square – and is very funny to watch.